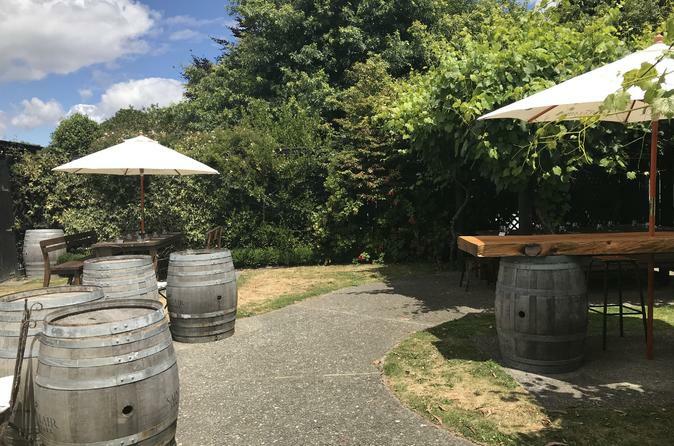 Cambie el puerto de cruceros por un tour de vino de Marlborough en esta excursión por la costa a media docena de bodegas boutique o más. Cuando su barco llegue a Picton, viaje en minivan a través de esta notable región vinícola en la Isla del Sur, degustando vinos premiados de Nueva Zelanda y degustando deliciosos chocolates. Opte por tiempo adicional para probar el vino y compre un almuerzo gourmet de temporada en este tour para grupos pequeños, limitado a 11 personas para una experiencia íntima. Pruebe los vinos aromáticos de sauvignon blanc, los chardonnays de barrica de roble y los collares secos. Visita Makana Boutique Chocolate Factory y muestra variedades de chocolates. El tour en grupos pequeños con un máximo de 11 pasajeros garantiza una experiencia más personalizada. En esta excursión por la costa sur de la isla, degustará delicias gourmet como el vino fino combinado con el chocolate. Comience su pequeño tour de vino en Marlborough con recogida en el puerto, luego viaje en minivan desde Picton a Marlborough, una de las regiones vinícolas reconocidas de Nueva Zelanda. Seleccione el tour de 5 horas o 6,5 horas en la reserva. Cada opción avanza a su propio ritmo y el número de bodegas visitadas de Marlborough puede variar (ver más abajo). Su guía experto lo introducirá en ramos aromáticos, notas especiadas y sabores complejos de vinos finos. Deténgase en la fábrica de chocolate Makana Boutique, donde podrá degustar una variedad de suculentos chocolates caseros, desde bocaditos rellenos de fruta y nueces hasta trufas aterciopeladas. Su tour termina con el transporte de regreso al puerto de Picton. A wonderful tour of the wineries with very pleasant guide April. Topped off with stop at the chocolate factory. 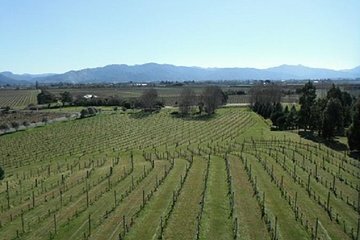 Dean provided a great cross section of smaller wineries in the Marlborough region. His local insight and approachable friendly manner made this a fabulous day. If you enjoy very goods wines and want to experience the Marlborough region as a local this tour is for you. There were just 8 of us on this small group tour, 3 couples traveling together (us and our friends) and another couple. What a fun day! We visited 4 wineries, sampled wine, bought wine, had lunch at one of the wineries and stopped at a wonderful little chocolate factory, couldn't have asked for a better day!!! Our driver was excellent, told us about himself and his connection to the area and how he came to be a driver for Viator. The scenery was spectacular, we especially enjoyed seeing the sheep grazing in the vineyards, so cool. Have used Viator in several places around the world and will continue to do so, have never had a bad time. A lovely day, even if you are not A wine expert. Our tour was pretty much as described with the exception that there was no wine and chocolate pairing, but we did stop at a rather expensive chocolate shop at the end. We stopped at 5 or 6 wineries and had a nice lunch at one of them. To be honest, our entire group only bought a couple of bottles of wine and most of us really only liked wine from one of the wineries. It seemed that each driver took his group wherever he wanted, so it was based on their choices. Good driver/guide. Visited 4 wineries with a lovely lunch at one. Lunch was at your own expense. We had a fun and informative day of wine tasting with Dean, our guide. Visited four different wineries. Each winery was expecting us and we had very interesting presentations from the winery staff. We learned a lot and had fun. We had lunch at one of the wineries not included in tour price, but delicious and fresh. Directions to meet the tour were spot on at the end Dean dropped us back at the pier. Great tour! A solid 5hr tour in a group of 11 fellow cruise passengers. Visiting 4 wineries of Giesen, Nautilus, Framingham and Allan Scott. A very enjoyable lunch was available at Allan Scott with accompanying refreshments. The countryside and vines are stunning. Wine Marlborough NZ tour company were very efficient and professional. They delivered on the day. Would highly recommend them for a good day out in this beautiful wine region. Great small group tour to wineries, local region, and a great place to have lunch. The driver was very helpful and also flexible. This small-group tour was fantastic! We visited four local wineries and a chocolate factory. I highly recommend this tour to get a great taste of the Marlbourough Wine Region.